The town of Sauraha is regarded as the Eastern gateway to Nepal’s Chitwan National Park. Sitting on the shores of the Rapti River, the village welcomes thousands of tourists annually, many of whom hope to catch a glimpse of the National Park’s wildlife. However, a visitor to Sauraha need not venture out of the town at all in order to encounter one of area’s star attractions, because Sauraha is home to approximately 65 domestic elephants and 50 government/INGO project owned domestic elephants. The elephant has always been an important Religious symbol for many across the nation and Sauraha’s domestic population are still used in ceremonies and celebrations today. The creatures were also once paramount in warfare, offered as gifts between dynasty rulers and used in big game hunting throughout Nepal. Today, the elephants are still used for a variety of tasks. As well as touring visitors through the dense Chitwan Jungle and sharing a ‘bath’ with tourists they are also used in the conversation of the vital natural habitat within Chitwan National Park. Biologists and conservationists using an elephant as transportation are able to continue their work without disturbing the endangered species they wish to research. The domestic giants are also used to clear areas of the jungle, causing much less disturbance and damage than a motorised vehicle would. The majority of the elephants living in Sauraha are privately owned by faceless individuals, with the task of caring for each animal given to individuals living in the town. 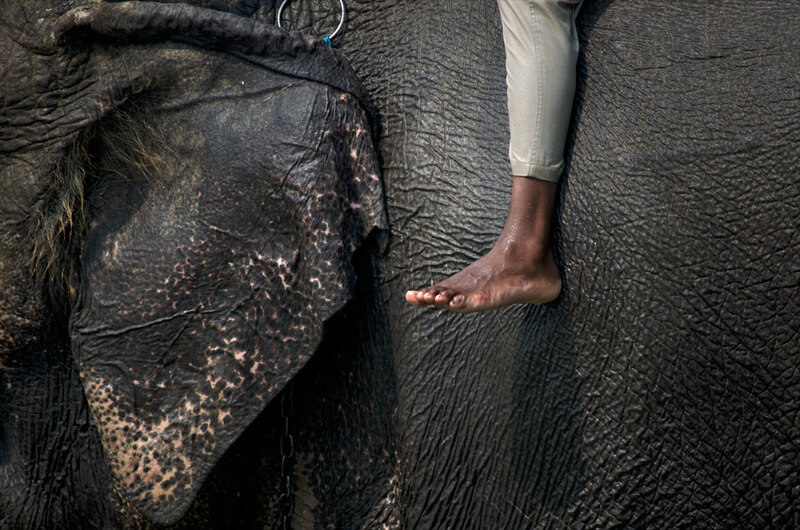 Those that care for the elephant, known as Mahouts, are paid a monthly salary in keeping with the average income for work in the tourism industry in Nepal. The elephant industry in Sauraha therefore provides a much needed life line to the Mahouts and their families. To be a Mahout is a dangerous profession though and stories of them being killed by a suddenly aggressive elephant are not unusual, with a death occurring on average once every 2 years. The industry is rife with controversy with many animal rights activists believing that domesticating wild animals is unjust and the training methods to do so cruel. Other’s believe that the positives of using an elephant for tasks such as conservation and maintenance outweighs the negatives. The topic is complex and the following images are but a glimpse into this controversial industry. 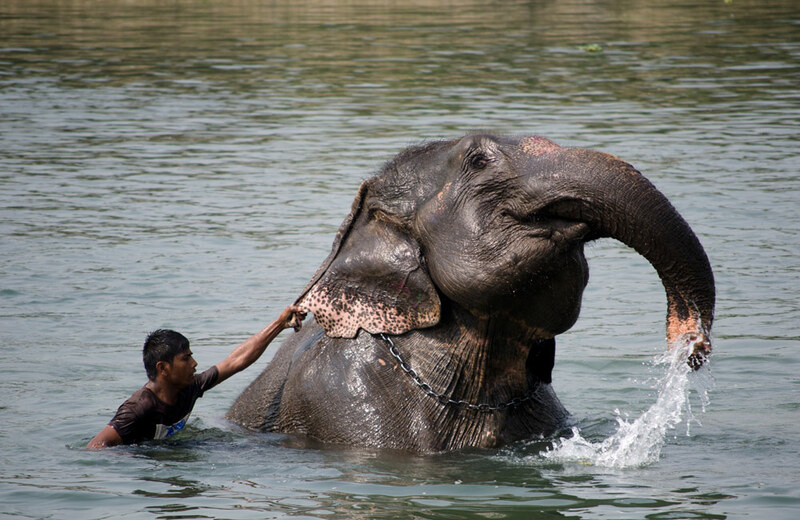 An elephant and her Mahout bathe in the Rapti River. Araj and Elisa with their family; His wife Atikunisa and their two children, 15 month old Muska and 3 year old Asad. 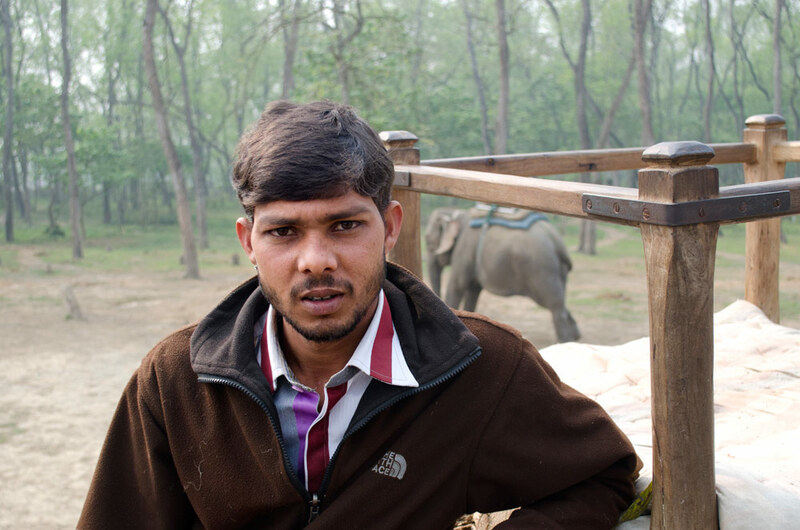 Despite spending a decade working as a Mahout, Araj is adamant that he doesn’t want Asad following in his footsteps. Asad will be the first in the family to attend school, beginning later this year and his father has high hopes for his future. ‘My name is Mohon and this is Gulap Kali. She is 50 years old. She had a calf but it died when it was young. I have been a Mahout for 15 years, my father before me was a rider and my son is now a rider too.’ The profession of Mahout being passed down through generations is not unusual in Sauraha, having grown up alongside elephants the transition to Mahout is natural for many. 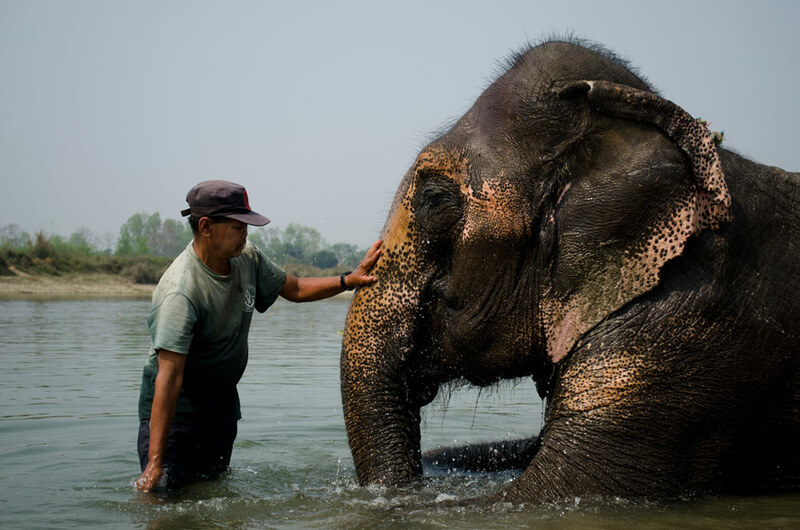 At around 11am every morning Mahouts bring their elephants to the shores of the Rapti River to bathe, giving tourists the opportunity to experience an ‘elephant bath’. Prompted by their Mahout commanding them to chhop, meaning ‘spray water’ the elephants shower the tourists sat on their back with their trunks. The cost of this experience varies, but a foreign tourist can expect to pay around 500 Nepali rupee for the privilege ($4.50). 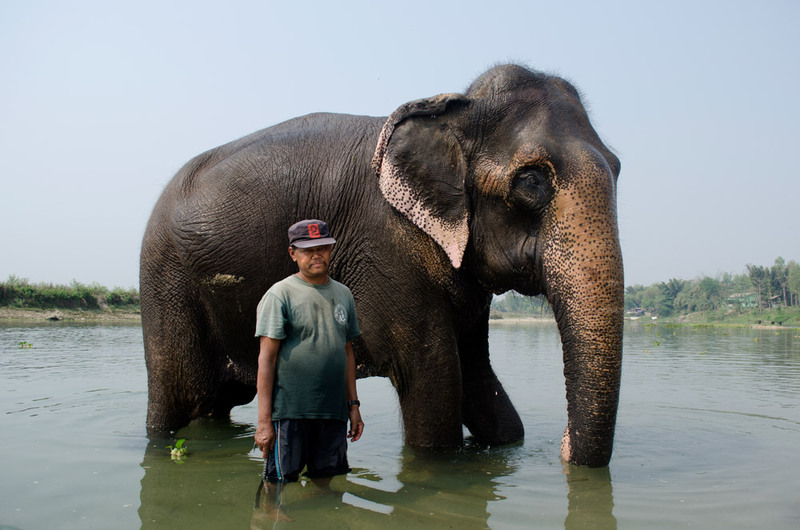 Mohon cleans Gulap Kali’s trunk in the Rapti River before retiring to the shore, leaving Gulap to explore the river freely. 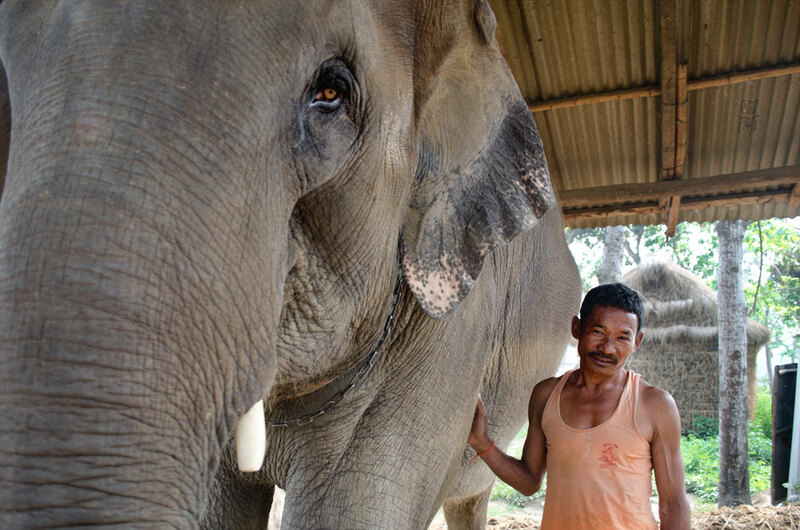 When called, Gulap immediately returns to her Mahout. A juvenile elephant, between the age of two and four, goes through intense training in order to prepare it for a working life. Animal welfare group PETA describe the main tools of training to be ‘intimidation, pain and harsh desensitization’. As part of the taming process, elephants are exposed to loud noises, fire and beatings. This is said to prepare them for exposure to forest fires, crowds of people and being ridden. 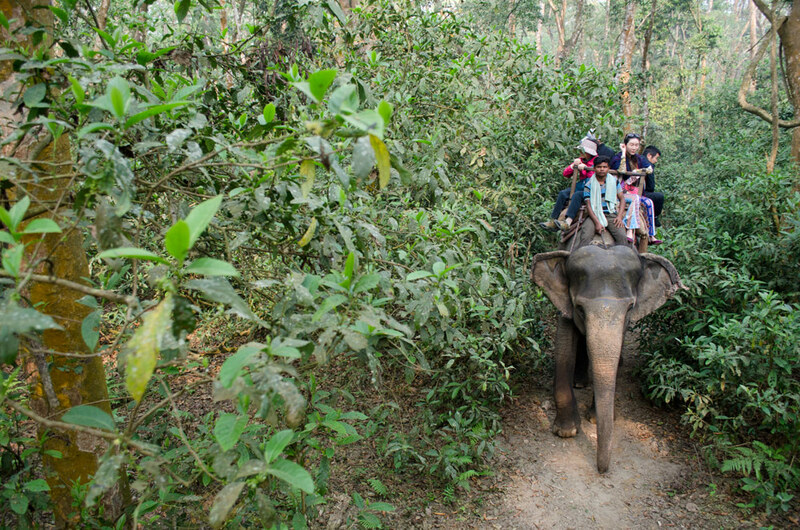 Forty-five year old Billo Rani carries four tourists and her Mahout through the dense vegetation of Chitwan National Park. 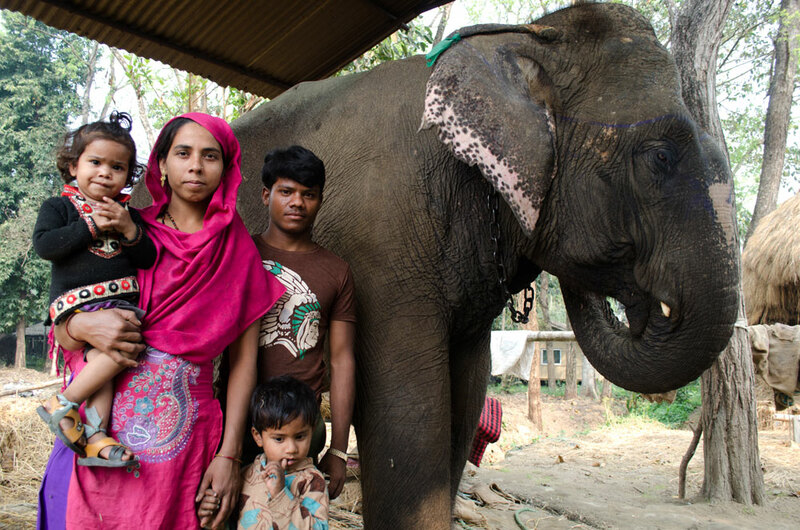 Billo, like the majority of elephants in Sauraha, is an Indian elephant brought from Asad. At sixty she will be ready for retirement. The area has come under criticism however for the lack of available retirement parks which activists claim leads many elephants continuing to work beyond their sixty years. When there are no tourists are awaiting an elephant bath, the Mahout bathes his elephant himself, vigorously rubbing her thick skin with a rock from the river. The time set aside during the day for bathing is considered to be rest and relaxation time for an elephant after a mornings work and many Mahouts take their elephants across the river and away from tourists during this time. 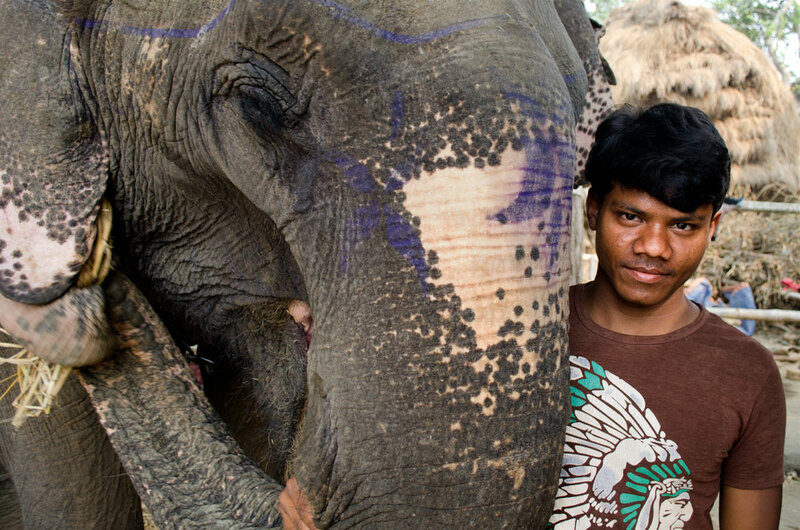 Every Mahout is a member of one agency which divides the work evenly between the elephants. Whilst some are called on for tourism duties, others will be required to assist in conversation based research for example. This practice ensures fair work for Mahouts and fair prices for visitors. Mahouts are able to generate extra unofficial income however, by informally inviting tourists to feeding time at home with the hope of a tip. Mahouts use their feet to guide the elephant, putting pressure behind their ears to signal direction. 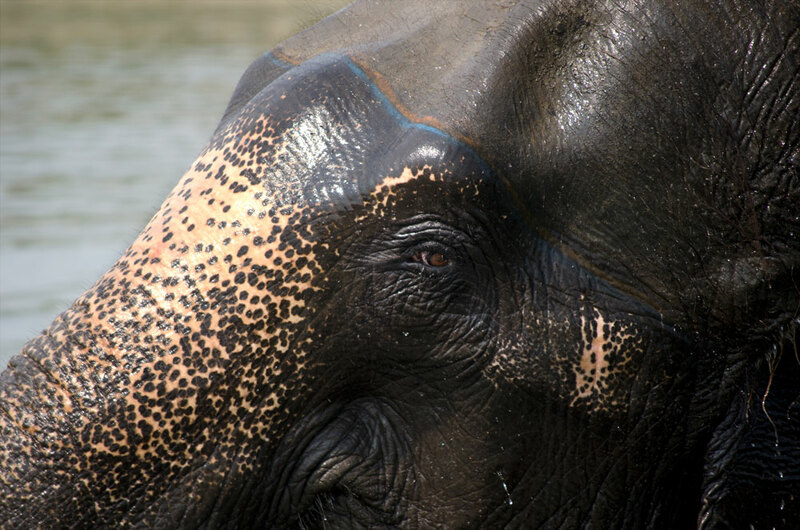 In other Asian countries well known for their captive elephants, such as India and Thailand, the elephant’s ear is pierced and a metal pole used to tug ears to signal direction. This practice is no longer widely used in Sauraha. Tourist alight from their elephant following an hour and a half’s safari around Chitwan Nation Park. Elephant safaris are popular among the nearly 180,000 annual visitors to the park but is one of the most controversial aspects of captive elephants. Elisa and her Mahout, Araj. 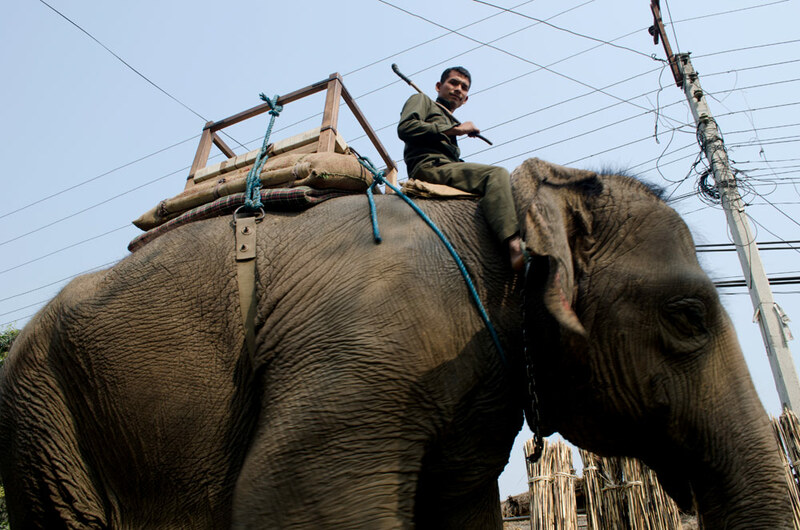 Araj has been an elephant rider for ten years and earns a salary of 8,000 Nepali rupee a month (approximately $75). Though this is an average income for those working within the tourism industry in Nepal, it is below that of the nation average. Araj wakes at 4.30am every morning to tend to Elisa, preparing her daily feed of 80kg, mucking out her modest pen and preparing her for a days work ferrying tourists around the jungle of Chitwan National Park. The elephant industry in Sauraha is a vital attraction for visitors and as a result, not only supports Mahouts and their families, but hotel, restaurant and shop owners in the town. 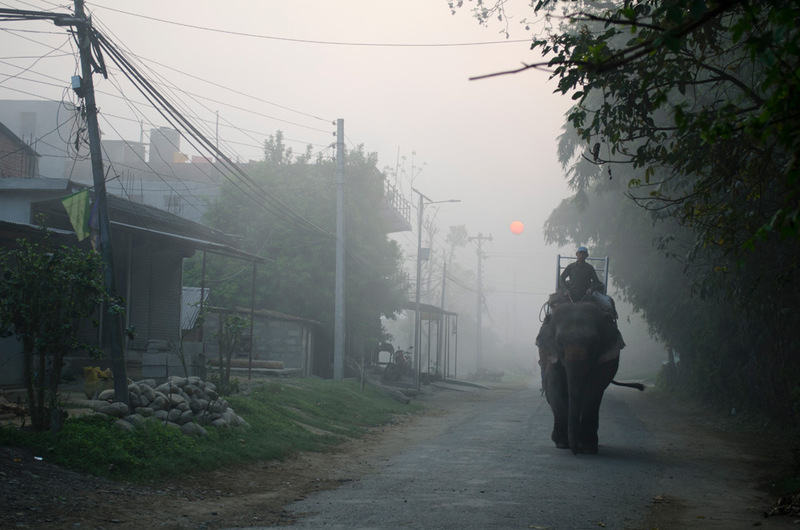 Elephant and Mahout make their way down on of Sauraha’s main streets towards the elephant safari starting point at 6am.